Chongwu Zhou and his team are creating energy-efficient circuits by integrating carbon nanotube (CNT) with thin film transistors. (Photo/ Chongwu Zhou). 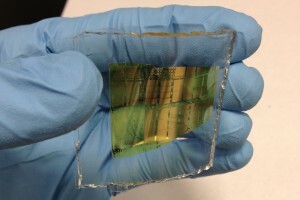 Researchers have created a flexible, energy-efficient hybrid circuit made from carbon nanotube that could one day replace silicon. USC took part in a two-day symposium featuring leading chemists, engineers, biologists and medical researchers who shared insights about recent advances in the use of nanotechnology. 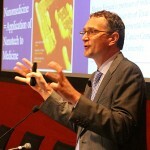 Mauro Ferrari discusses the application of biomedical nanotechnology. Small medicine was the big idea as the Health Sciences campus hosted the USC Ming Hsieh Institute for Research on Engineering Medicine for Cancer Symposium on Sept. 29.